Intellitec's Single Disconnect Battery Control Center offers the battery control functions used in smaller motorhomes. It includes a remote disconnect for the auxiliary battery, a bi-directional isolator, auxiliary start function, and nine fuses to supply protected power from the auxiliary battery and ignition switched sources. One of these outputs is hot only when the ignition is off, to be used as a lock out for various functions such as slide outs and TV. The bi-directional isolator relay delay (BIRD) function charges both batteries when either one is being charged. When the coach is being driven, both batteries will be charged from the engine's alternator. When the coach is plugged into shore power, both batteries will be charged from the converter. If neither battery is being charged, the batteries are fully isolated. The controller also senses heavy loads on either battery to prevent the wrong battery from being inadvertently discharged. After the solenoid has been closed, the system continues to sense the voltage. If the ignition switch is off and the battery voltage drops below 12.8 volts for approximately 5 seconds, the solenoid is opened to prevent the chassis battery from being discharged by the coach loads. This might occur when the converter is heavily loaded. If the ignition switch is on, the control allows the voltage to drop below 12.0 volts for approximately 5 seconds before the solenoid is opened. 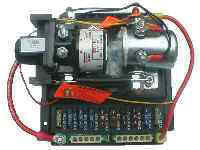 This insures the alternator's full output is available for important chassis functions . The unit is housed in a plastic enclosure for mounting in an engine compartment. Battery cable connections are made directly to the isolator. The remainder of the connections are made through Mate-N-Lok connectors to make installation fast accurate and easy. The remote disconnect can be used with Intellitec's BD-0 or BD-1 panels and cables or can be wired to a user supplied switch.